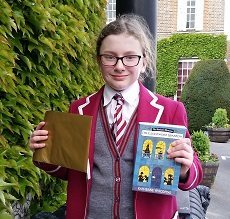 Congratulations to Olivia in Year 5, who won first prize at the Cranleigh Book Awards for her book Review of ‘The Mystery of the Clockwork Sparrow’ by Katharine Woodfine. A group of Milbourne Year 5 students and their parents were invited to attend this annual event and it was a wonderful achievement of Olivia’s to win the best book review. The Awesome Book Awards hosted by Cranleigh Prep, honours the best new fiction for 7-10 year olds. This year the five shorlisted books were: Beetle Boy by M G Leonard, The Mystery of the Clockwork Sparrow by Katharine Woodfine, Aubrey and the Terrible Yoot by Horatio Clarke, Time Travelling with a Hamster by Ross Welford and The Imagination Box, by Martyn Ford.